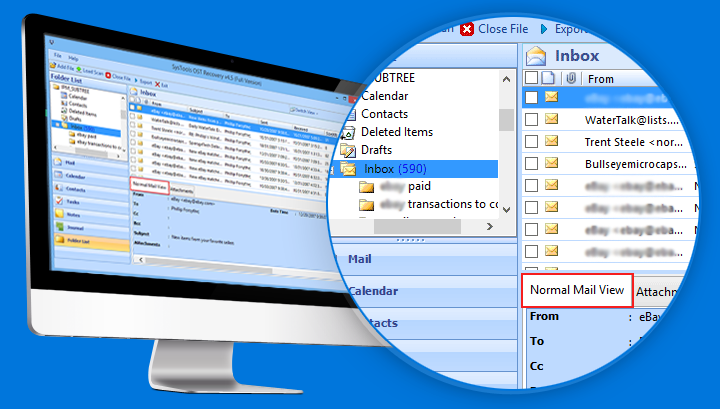 A Creditable & Exclusive Tool to repair Outlook OST in Multiple File Format in safety. Software to Repair Orphaned/Deleted OST Files Resourcefully. Convert OST File as PST, EML, HTML, MSG and Office 365 email profile. Divides Resultant PST Files of any size. To get the process of OST repair done and to save the data that are stored in the OST files, get a transcendent solution like the OST Recovery software, which will handle any issues related with the OST files and its inaccessibility. The OST files are offline storage tables which help in working offline and also they are vulnerable to corruption in many situations. The reasons that cause OST file corruption, most of the cases are unintentional or accidental. One such reason is that, once user dismount the server to prevent the unauthorized usage and when try to mount it again issues arises in form of error messages and thus resulting in the inaccessibility of OST files. This is because OST files can be viewed and accessed only in the server collaborated environment. The problems become critical when the OST files carry some data that are unavailable anywhere else, or some email that is unread is in the OST file that becomes inaccessible now. To overcome the situation and to Fix MS Offline Storage corrupt files with reliability OST File Recovery software offers ease in the data recovery from inaccesible OST files and convert them to other formats like PST, EML, HTML and MSG which is readable and accessible without connected to the server. This user convenient OST File conversion application facilitates to Export OST Emails, calendar items, tasks, attachments, notes etc. Moreover allows exchanging OST in MSG, HTML and EML also, thus it makes easy to open Offline Data in Outlook 2019, 2016, 2013, 2010 and more. Outlook OST Repair eliminates all corrupts from OST files by scanning process. There is two mode in tool- Quick or Advanced scan. By default Repair OST to Outlook software follow quick scan but if your data is highly damaged .ost database then Advance scan will be best. After completion of Scanning, this OST file repair utility generates clear preview of all OST components like Emails, notes, attachments, calendars, contacts etc. To save time you can prefer the most useful OST Mail filter that included with this Outlook OST Repair 2010 utility. You can specify the particular date range to extract & export OST Emails in PST/HTML/MSG/EML according to date. Resultant PST file can be further break into small size file by utilization of PST split options of software while export OST in PST. Just need to specify the file size in GB, It will diminish data corruption chances if large size PST data. All Meta Data like To, CC, BCC, sent etc of OST emails will be preserve that means no change of data alteration or lose is there while perform OST files recovery/migration with this fail safe OST Repair toolkit. This OST repair software can easily decrypt and remove OpenPGP and S/MIME encryption from OST file. The user simply needs to check the “remove encryption” checkbox. And also the user has to provide associated certificates (With passwords) to decrypt S/MIME emails and or Private keys( With passwords) in order to decrypt OpenPGP encrypted OST emails. Search All drive: This option enables the users to search OST file from all the drives. The lineaments of the tool that is the result of advance algorithms used make the tool work perfectly under situations that are critical and complicated. Let the reason of corruption of OST files be anything, OST Recovery tool will repair Outlook OST and OST into PST conversion also with ease. I come to know this awesome utility after a number of searches over the internet when my Offline data was severely damaged and few was lost. I contacted to the tech support for software solution, afterward tried myself. I become surprised to get back even lost items and got files in healthy formats. The OST file repair has provided me the simple approach to repair corrupt ost file with perfect result. By analysis got the effective solution in few instances. Amazing features are within it like friendly interface, Splitting PST, Emails filter, and multiple Conversions. I really enjoyed using it. Which OS is supported by OST file Recovery software? Is there any role of MS Outlook? This is simple driven a Windows based OST repair tool, supports all the old and new Windows editions like Win7/Win8/Win 10, Win Mobile (32-64 bit). Yes you have to install the Microsoft Outlook before the execution of OST repair. Can I decrypt OpenPGP and S/MIME encrypted OST file emails? Yes, by using this OST repair software the user can easily decrypt S/MIME and OpenPGP encrypted OST file emails. Is there any size limit to recover OST data or convert OST files in PST? No, OST File Converter software smoothly performs OST recovery and conversion for unlimited OST data. Even it gives the PST split option for resultant and oversized PST file during conversion. Can I convert multiple OST files to separate PST file by using this software? Yes, the user can easily convert multiple OST files to separate PST files. Will it need the MS Exchange Server set up for OST file recovery? No, this application program repairs OST emails, contacts etc without set up the Exchange server.